Being grain free, I often long for a nice fudgy brownie that I can actually eat without disrupting my gut that I’ve been trying to heal for over a year now. 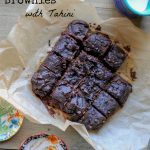 I’m also all about healthy desserts, so I am stoked to share this recipe for paleo sweet potato brownies that I included tahini within. Read on for a not too overly sweet treat that you calm your sugar craves without sending you through the roof. And spoiler alert: since these have healthier ingredients within, you don’t have to feel guilty about having them with that first (or second!) cup of coffee in the morning. I heard it from a friend, wink wink! Vegetable-ful, and who doesn’t like more of those?! Tahini, in it’s simplest form, is ground sesame seeds. It’s mildly nutty, super creamy (if you get a good one! ), savory and full of flavor. Beware that if you get a bad tahini, it will have LOTS of oil floating on top (which can go rancid if it sits on the shelf too long) and will be clumpy at the bottom. Don’t let a bad experience deter you! I love this tahini since it’s pourable, spreadable and very simple to use in this recipe, in addition to in dressings, for topping vegetables and more. This is also a super spreadable tahini that I use and like. 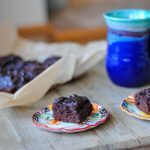 Super fudgy grain-free and paleo sweet potato brownies with tahini. No refined sugars, but plenty of gooey goodness. A healthy treat! Preheat the oven to 350 degrees Fahrenheit. Line an 8x8 baking pan with parchment paper. Mash sweet potato (without skin) in a large bowl. Add in maple syrup, egg and tahini and mix to combine. Add cocoa powder, coconut flour, baking soda and cinnamon and mix with a fork to ensure it's all incorporated. Add in vanilla extract and mix. Using a spatula, scoop batter (which will be thick) into parchment-lined baking pan and flatten. If adding chocolate chips, sprinkle on top and gently push into batter. Bake 23-25 minutes. Remove from oven and let cool. Once cool enough, place in refrigerator for a few hours (overnight for best results) before enjoying. *To cook the sweet potato: Either cook in the microwave using the settings on your model until cooked, or (my preferred method), roast in the oven at 400 degrees for 45-60 minutes. 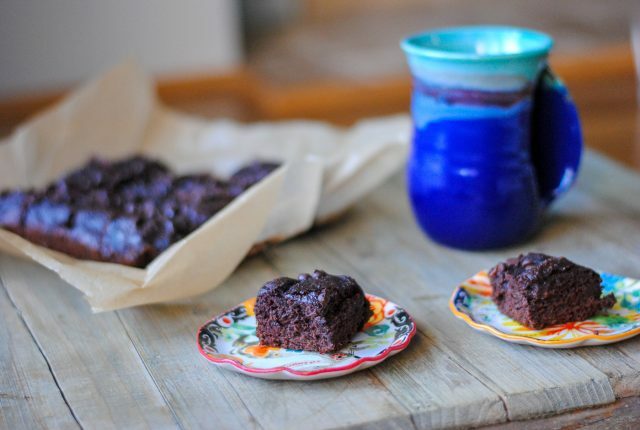 Let me know if you try these grain-free, dairy-free but not flavor-free healthy brownies! Enjoy! I’m drooling over these! These brownies look absolutely perfect. I have learned that in using a microwave it kills the nutrients that we need so we have stopped using it. Right now I warm things up in a pot (i.e., coconut oil), but I plan on getting a convection oven. Water can be used in the convection oven (I guess steam) and it’s supposed to be much healthier cooking. Check it out. Convenience is not always the best for us. I’m with you. Forget microwaves!!!!! Sweet potatoes in the oven are SO much better than in the microwave IMO, and assuming you have time:). 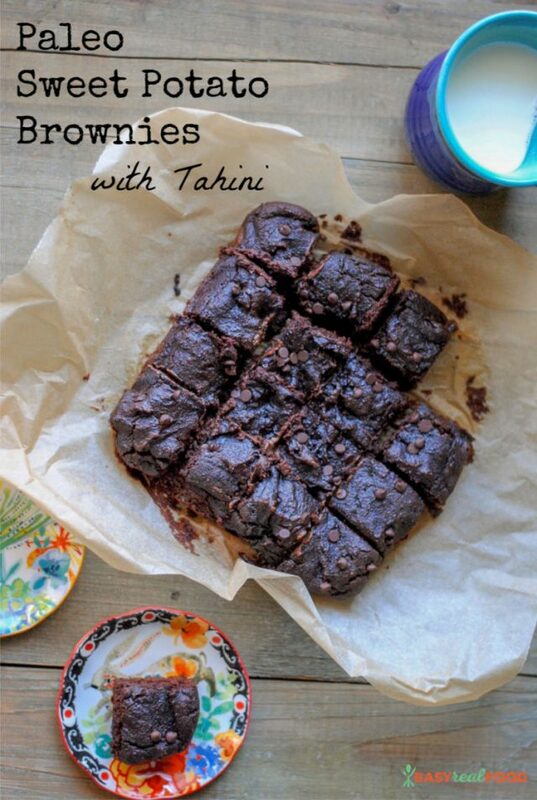 I have never made brownies with either tahini or sweet potatoes — looking forward to trying! 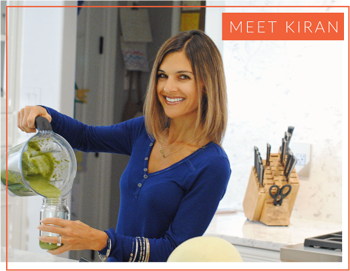 Love all the extra nutrition they add! These brownies look and sound fabulous! Will be making these for sure.. I love baking sweet potatoes and will bake up a few.. and save one for this recipe asap!! Yay! The sweet potato/tahini combo makes it super creamy and fudgy. These look perfectly fudge and amazing! I can’t wait to try them!